Barbara and I are staying at the Winchester Mansions Hotel in Cape Town this week, and today we had a wonderful lunch in the company of Roger and Janet Thomas, and Rod and Kathy Whyte, sharing memories of our Copperbelt experiences and the people that we have all known over the intervening years. 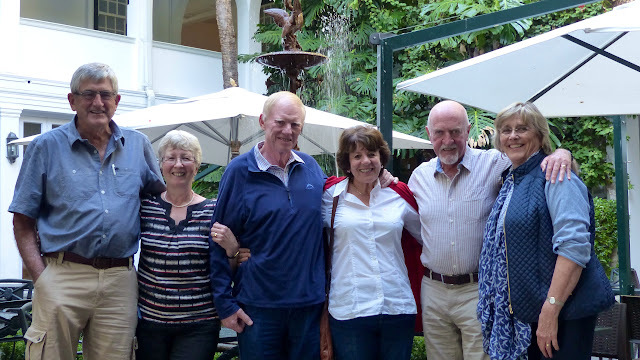 We had a reunion with Roger, who I had not seen for 44 years, last year at the Vineyard Hotel. We worked together for a short time during my early years in Zambia. He is now retired and living in nearby Constantia, and he and Janet are good friends with Rod and Kathy, who live in Johannesburg but are house guests this week in Cape Town. Rod and Roger were at the same school in Bulawayo, and then left for University in England, Roger to Birmingham and Rod to Leeds. Rod commenced studies at Leeds in 1963, the same year as me, so it is amazing that our paths have never crossed until today. He studied Chemical Engineering, me Metallurgy, in the Houldsworth School, so we must have attended the same communal lectures. Rod's experience is vast having spent 11 years on the Zambian Copperbelt and 26 years with Anglo American in South Africa. During his long-standing career with Anglo American he was involved in various capacities in Research and Development, Plant Operations and New Business Development. In his capacity as Head of Metallurgy, between 1998 and 2004, he was the senior metallurgist in the company with responsibility for the effective functioning of the metallurgy discipline within Anglo American. His experience is multi-commodity, covering a range of different process areas (mineral processing, hydrometallurgy, pyrometallurgy) in a number of countries worldwide. More specifically, he has an in-depth knowledge of copper metallurgy and processing, from various deposits in the Zambian Copper belt as senior metallurgist, as Chairman of Anglo American Research Laboratories and also as a Director of Palabora Mining Company Ltd.
All too soon lunch ended, but it was great to catch up with Roger and Janet again, and to finally share memories with Rod and Kathy after all these years. We have all had interesting experiences around the world via our great industry and I know that we would all be delighted to hear from anyone who worked with us during our long careers. Nice to see a picture of Rod and Kathy, who, in particular seems to aged really well. Rod was my first boss in Kitwe in 1973, and I met up with both in SA round the turn of the century whilst I was with Hatch. I have lost touch since then, so it is nice to know are doing well.